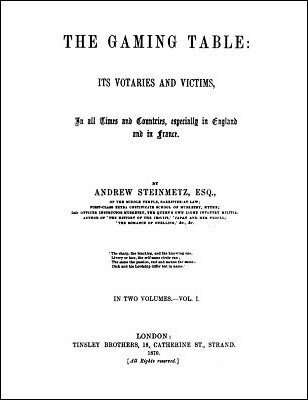 The full title of this work is The Gaming Table: Its votaries and victims in all times and countries, especially in England and in France . It is essentially a history of gambling detailing people and places. It does include some exposure of cheating, but most of that is told in volume 2 . CHAPTER I. The Universal Passion Of Gaming; Or, Gaming All The World Over. CHAPTER II. Gambling Among The Ancient Hindoos.—A Hindoo Legend And Its Modern Parallel. CHAPTER III. Gambling Among The Ancient Egyptians, Persians, And Greeks. CHAPTER IV. Gaming Among The Ancient Roman Emperors. CHAPTER V. Gambling In France In All Times. CHAPTER VI. The Rise And Progress Of Modern Gaming In England. CHAPTER VII. Gambling In Brighton In 1817. CHAPTER VIII. Gambling At The German Bathing-Places. CHAPTER IX. Gambling In The United States. CHAPTER XI. Gambling Poets, Savants, Philosophers, Wits, And Statesmen. Was The Duke Of Wellington A Gamester? CHAPTER XIII. The Lotteries And Their Bewilderments. CHAPTER XIV. The Laws Against Gaming In Various Countries. 1st edition 1870, 436 pages; PDF 172 pages.